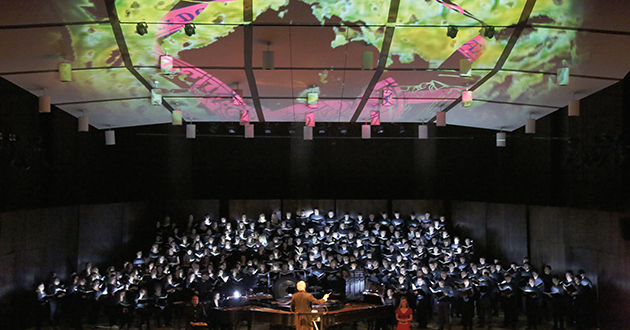 This past winter, more than 40 Ohio State faculty and staff members across all disciplines honed their singing skills to join the School of Music and the Advanced Computing Center for the Arts and Design (ACCAD) in a multimedia performance of Carmina Burana, the iconic cantata composed by Carl Orff in 1935-1936. This unique, first-of-its-kind collaboration, which culminated with two performances on Feb. 25 in Weigel Auditorium, began with a simple idea from Kristina MacMullen, associate professor of conducting and assistant professor of choral activities in the School of Music. “I wanted our faculty and staff across the Ohio State community to interact, create together and work toward something bigger than themselves,” said MacMullen. So, she extended an invitation to all faculty and staff members to join Ohio State’s various student choirs in a large-scale choral production — no experience necessary. Almost everyone has heard the dramatic opening and closing movement, “O Fortuna,” which appears in countless films — from Excalibur to Jackass: The Movie — TV shows and advertisements, often in a satirical nature. But the larger cantata Carmina Burana, based on the medieval poetry collection of the same name, comprises 23 additional movements, which are mostly in Latin. Themes span age-old topics of life, death, wealth, gluttony and lust, among others. “I heard this piece performed in a church when I was on sabbatical in Copenhagen, and it was a beautiful experience,” said Allison Snow, Arts and Sciences Distinguished Professor in the Department of Evolution, Ecology and Organismal Biology and one of the faculty members who took part in the production. Though Snow had some musical experience in high school, it had been years since she was part of a large choir. “It sounded like a great opportunity and I just thought, ‘Why not?’ — I want to relearn these things I used to know about music and not just do biology all the time,” said Snow, who, along with other participants, attended weekly, hour-long rehearsals for two months leading up to the show. “The power of this music has really been confirmed by the investments people made to join us,” MacMullen said. Along with the inclusion of nontraditional vocalists, the production included another special element. “Orff included a very mysterious indication in his title — he described it as a secular cantata for chorus, instruments and ‘magic images,’” said Anna Gawboy, associate professor of music theory. According to Gawboy, the term “magic images” was likely a reference to magic lantern shows, which were popular in the late 19th and early 20th centuries and combined projected images with live narration and music. But because there are no surviving records from Orff’s original performances of Carmina Burana, there’s no way to determine with certainty what he meant. She and Alex Oliszewski, associate professor at ACCAD and the Department of Theatre, teamed up to create an unforgettable digital-visual design that was projected onto the ceiling of Weigel Hall during the production. Brilliant lights and moving images were played in real time using a custom-designed MIDI controller that operated “like an instrument,” explained Oliszewski, who developed most of the technology. The production also brought in community players such as the Hilliard Youth Chorus, as well as guest conductor Richard Bjella, director of choral studies at Texas Tech University. The final performances included two additional conductors, more than 300 singers, a percussion orchestra and two pianos. Some singers had to position themselves off the stage, which was filled to its perimeter. “I learned a lot — the people were really friendly; the music was really thrilling and it’s just brought me a lot of joy,” said Snow.